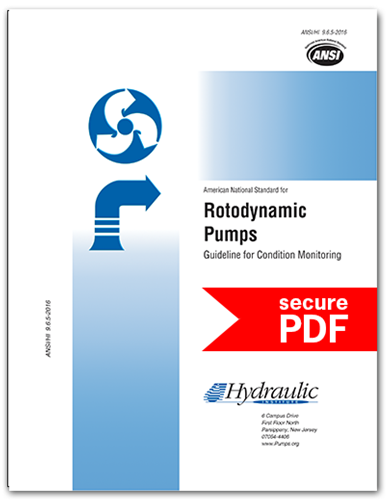 Rotodynamic Pumps Guideline for Condition Monitoring (ANSI/HI 9.6.5-2016 - secure PDF). Details of condition-based maintenance maintenance introduction in the main body as well as an educational section in the Appendix. Practical views on control limits. Expanded and more detailed leakage monitoring section. Updated vibration control limits section. New wireless data transmission technology section. Extensive vibration analysis education section in Appendix. Detailed condition-based maintenance education section in Appendix. Educational material on condition maintenance as a tool to manage asset reliability in Appendix. Scope of Standard: ANSI/HI 9.6.5 offers pump monitoring and failure detection techniques for rotodynamic (centrifugal and vertical) pumps, both sealed and sealless designs. What You Will Learn/Overall Benefits: Understand the conditions that can effect pump operation to determine what type of instrumentation should be included with pumps to monitor different criteria in predicting maintenance cycles and identifying trends related to pump reliability and need for service. Applicable Markets: While useful to a broad range of markets, standards will prove especially useful to the petrochemical, utilities, mining and other industries where safe and reliable operations are of greater concern. Content: Recommendations on frequency of monitoring factors related to potential pump failure modes including temperature, power, corrosion, leakage and pressure, vibration, rate of flow, lubricant analysis, speed and more in predicting pump reliability. Also covers control limits, maintenance inspection, hydrostatic test, design review practices, pump failure modes and condition monitoring indicators that should be monitored to prevent failure. Who Should Buy This Standard: Pump users and those who oversee the operation of pumps.